Simplify your life with ten car hacks: charge your phone while you drive, use a tennis ball to park, and prevent dings with pool noodles. Everyone gets annoyed at their car for some reason or another. Maybe it doesn’t have all the features you wish it did. Maybe it’s developing some slight deficiencies as it ages. Maybe it’s not the car’s fault at all, and is an environmental situation. Whatever bothers you about your car, it doesn’t mean you have to accept it. There could be a car hack that applies to your situation, effectively simplifying your life and your driving experience with little to no cost. When we talk car hacks, we aren’t talking about getting control of the car through a computer. We’re talking real-life, easy-to-use solutions using items you either have on hand or can purchase inexpensively. Is your favorite pie place a county away? Do you normally have to reheat your pizza by the time you put it on the dinner table? If this is you, use a feature that’s probably built into your vehicle (unless you drive a base model). Put the pizza box directly onto your passenger seat. Turn on the heated seat, and voila! You have a built-in pizza warmer already in your car. Carrying a passenger in the front seat? Send them to the back, because after all, a warm meal is important. There’s nothing as frustrating as finding a new scratch on your car when you come out of the store. You try to keep your car in mint condition for as long as possible, and the scratch happens anyway. If the scratch isn’t too deep, you can fix it almost invisibly with clear nail polish. Here’s what you do: wipe the scratch well with a moist alcohol wipe. Get all the dirt and loose paint out of the scratch, then evaluate if the scratch is down to the metal. If it didn’t go through the paint, use clear coat nail polish to fill the scratch. While it’s wet, wipe the raised portion off with the edge of a card for a nearly seamless repair. It may not be perfect, but it’s less expensive and time consuming than a proper clear coat repair. If the scratch is down to the metal, perform the same procedure but use the closest nail polish tint you can find to your car’s paint. Don’t use the shoe you’re actually wearing right now. If your car is more than a decade old, there’s a chance you don’t have a cupholder in your car. That won’t preclude you from getting a drink with your value meal anymore, though. Use a spare sneaker as a cupholder in your car. Place it between the front seats by the gearshift or even on the passenger seat while it’s not occupied. The shoe provides a wider base for the cup, keeping it upright while you keep both hands on the wheel. Just be sure to deodorize the shoe before using it as a cupholder. As a side note, sandals, flip flops, and cowboy boots aren’t very useful for cupholders. At any number of gas stations, dollar stores, and convenience stores, you’ll find electronic charging cords and plug-ins to replace the ones you’ve lost or broken. 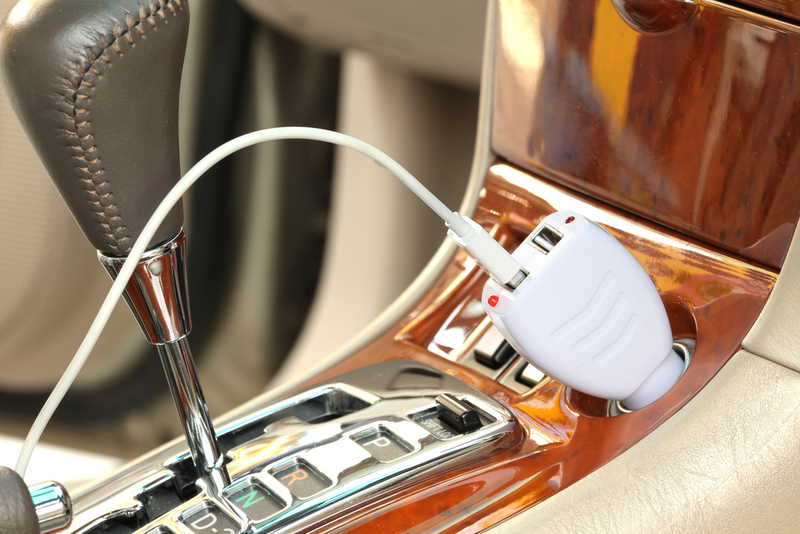 One such device is an adapter that fits into your cigarette lighter, with either one or two USB ports on it. It’s really quite self-explanatory. In an age where everyone has a phone or tablet that can recharge via USB, it makes sense to charge up in your car. Just don’t be using your device while you’re driving. Are you needlessly burning gas driving in circles because you’re too proud to ask for directions? Use a GPS device to get where you want to go in the most direct route. Most smartphones are capable of providing navigation to your destination as well, giving turn-by-turn directions and recalculating routes when you make a wrong turn. Combine the GPS navigation on your phone with the USB charging port to prevent your phone from dying before you arrive at your destination. Nowhere to put your phone? Put it in a shoe by your shifter. This hack is as old as time, and pantyhose are becoming more rare, but it’s still one of the most effective car hacks. If your car’s V-belt breaks, use a pair of pantyhose as a temporary belt replacement. It’s not going to last much further than getting you to a safe place, so keep in mind it’s temporary. Tie the pantyhose tightly around the pulleys the belt used to run around. The hosiery will keep critical parts like the water pump and power steering pump moving, at least at minimum capacity until you can contact YourMechanic to replace the belt. In wintry weather, frosted windshields can take forever for your car’s heater to clear. A simple solution is to park with your car facing east. That way, as the sun rises in the morning, it will melt away frost and fog so you can reduce your idling time to clear the windows. If you have a garage, you know it’s nearly impossible to line your car up perfectly inside so there’s still room to maneuver around it. You can get laser pointers to mount on your roof, helping you identify when you’re parked right. There’s a cheaper car hack, however. Attach a length of string to a tennis ball using an eyelet screw. Insert another eyelet screw in the ceiling of your garage, directly above the center of your car’s windshield. Tie the string to the ceiling eyelet, ensuring the tennis ball is touching your windshield, but just barely. Now, anytime you pull into your garage, stop your car when you touch the tennis ball, and you’re perfectly parked inside, every time. If you’ve ever seen someone put their key fob to their chin and press the button, you’ve probably wondered about their mental status. But, this is an effective method for getting a few car lengths extra range from your key fob. The fluid inside your head acts as a conductor for the signal, amplifying it just slightly. Especially if your key fob battery is weak, it might be enough to unlock your car when it’s otherwise not strong enough. If you’ve ever dinged your car door against the garage wall when you parked inside, you know how frustrating it can be. Inflicting damage on your own car just makes it all the more frustrating. A simple, cost-effective solution to prevent your own door dings is to fasten half a pool noodle to the garage wall. Slice the noodle in half lengthwise, then fasten it to the wall using long screws at the height where your door would normally make contact with the wall. Put one on the passenger side on the garage wall as well, so your passenger doesn’t offend you either. Now when you open your doors, you don’t need to be quite as careful to prevent damage. These and other car hacks make your life easier, but they don’t take the place of proper car maintenance or repair. If you need car repairs, for example a serpentine belt replacement (and not just pantyhose), YourMechanic can take care of it for you. Q: Where are the spare tire and jack? The spare tire and jack are located in the trunk. To access them, open the trunk, remove the cargo cover (if extended), and lift up the luggage floor board. Q: What does the service due Warning Light mean?